Every November, tens of thousands of people sign up for National Novel Writing Month and attempt to write a 50,000-word novel. Baty, the brains behind this competition, has produced an uproariously funny motivational manifesto so readers can get a leg-up in his race or in the larger publishing game. I participated in NaNoWriMo for the first time in 2007. I didn't make it to 50K, but it was an amazing experience. I read this book with almost 2 months' distance from it and I wish I had read it in October. I came to many of the same conclusions that Chris had made but through the hard way of personal experience. I've done NaNoWriMo several times now. The first was a novel called "Arts Pentathlon". It was fun and exhilarating, and I really didn't expect to kill one of my main characters off so quickly. But it worked out. The second time I tried, nothing jelled and and I didn't finish. The third time, same deal. The fourth time, I used it as a means of writing the first draft of a non-fiction book. I made it, but have not gone back to edit it yet. Baty's friendly and engaging style attempts to make the task of writing a 50,000 word novel in 40 days seem exhilerating and fun. Anecdotes from former Nanwrimo winners punctuate the text, along with a plethora of tips to keep going. I love love LOVE this book. I bought it after NaNo last year and may not use it for an actual guide to NaNo, but the thought processes and the inspiration/motivation in this book is wonderful. 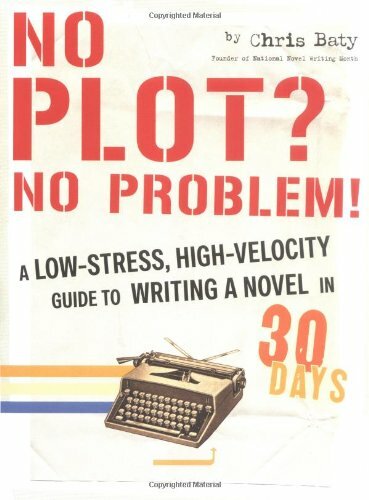 I did NaNoWriMo for the first time this year, and this book helped me tremendously. I don't think I would have been able to finish my novel without all the tips, ideas, and encouragement I got from this book. Highly recommended. A writing guide for those of us who wrote 50,000 words in a month (National Novel Writing Month). Includes tips on location, setting, character development, plot ideas, etc, and also has a bit about editing and getting published. I love reading this the week before NaNoWriMo starts. I don't use many of the writing tips, or follow the weekly motivations. I just know after I read it, my mind will catch on and I'll start coming up with ideas that I can't wait to write about. This book works. I read it, then I wrote a novel. No, I'm not kidding. In fact, the book is more interesting than just a guide; it's hilarious, and really helped me set asside editing until later. Much later. If you enjoy writing, you'll love this book! Written by the guy that started National Novel Writing Month, this book is about that journey and how to get yourself through to that 50,000 word goal. Interesting perspective, fun to read. Quick read by the creator of NaNoWriMo on how NaNo works. Interesting thoughts and really helpful if you're a NaNo participant, or thinking of participating. Follows through pretty acurately what to expect in the month long novel writing endeavour. A good book describing some techniques to get past writer's block and win the NaNoWriMo (Nation Novel Writing Month) challenge. It's been a while since I read it, but I remember it being both entertaining and well written. I dock it a star only because I have mixed feelings about NaNoWriMo. It's a good exercise, but I'm not convinced weighing your novel by word count is a good approach. 50,000 words that were written is such haste that they should be scrapped and rewritten isn't much progress towards writing a novel... unless of course it helps get you over some kind of fear factor or other writing inhibition. The world is saturated with reading material at the moment. It doesn't need your novel. Everyone could stop writing today, and we'd still have more literature than anyone could possibly read in a lifetime. The world doesn't need more books. Which doesn't mean I don't think good books aren't important or valuable. But I'd rather see someone take five years to craft a true masterpiece than slap out something in a month and try to hoist on an unsuspecting public. If you can write good stories that fast, more power to you, but you are a rare person. On the other hand people writing for the joy and challenge of it is a cool thing. NaNoWriMo has helped breed a community of writers who compete with, support, and challenge each other. It's definitely possible to do NaNoWriMo without this book--especially if you waste your precious noveling hours at the nanowrimo.org website--but this book is reassurance, encouragement, and a kick in the pants all at once. I picked it up again before setting off into this year's novel, and I finished it with a better idea of what I'm going to write...and more realistic expectations for the final product. Not a reference book for everyone, but definitely had some great tips for completing NaNoWriMo. Also written in a way that had me giggling out loud a lot. This was a fun, fast read that gave me plenty of inspiration and motivation to complete NaNoWriMo this year.